I used to read poetry to my children when they were young, lines like….Little Orphan Annie came to our house to stay, to wash the cups and saucers and sweep the crumbs away or…. They’re changing the guard at Buckingham Palace, said Christopher to Alice. 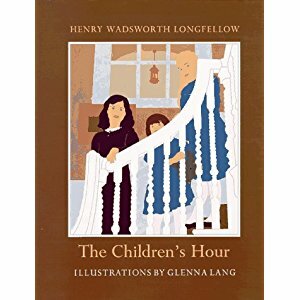 Poems about Lincoln and battles and always Longfellow’s, The Children’s Hour. 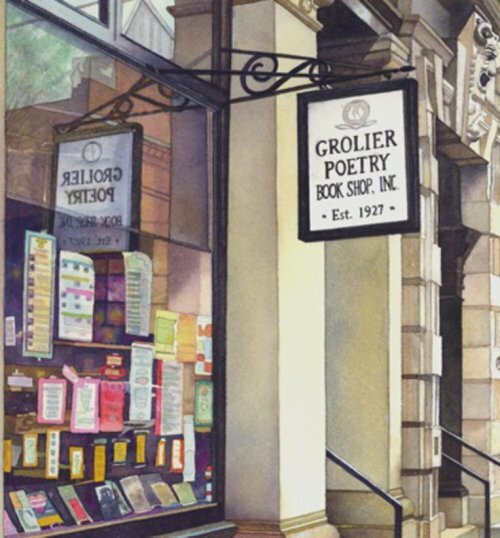 “The Grolier” is an independent bookstore on Plympton Street near Harvard Square in Cambridge, Massachusetts, Its focus today is solely poetry. A small one-room store, it lays claim to being the “oldest continuous bookshop” devoted solely to the sale of poetry and poetry criticism. The Grolier Book Shop was founded in September 1927 by Adrian Gambet and Gordon Cairnie. Louisa Solano purchased and took over its operation in 1974 after Cairnie’s death. The Grolier Book Shop became the Grolier Poetry Book Shop, Inc. in 1990. One of my favorite poets, Anais Nin, visited the store. In April 2006 Ms. Solano sold the Grolier Book Shop to Ifeanyi Menkiti, poet, and professor of philosophy at Wellesley College. The Grolier continues to advance the cause of poetry, expanding on the foundation laid by the previous owners. Part of the store’s mission is to develop further interest in poetry among a wider more diversified audience. Through the sale of poetry books and the organization of poetry events, The Grolier promotes the written and spoken art of poetry and continues to create a nourishing environment for the works of poets. I love poetry and find it a balm for the soul. I’m not sure if my tastes fit with today’s poets and readings, but I am grateful that Grolier’s is holding down the fort when it comes to the genre of poetry. This entry was posted in Ato Z Blog Challenge 2018 and tagged Anais Nin - Poet, AtoZ Blog Challenge 2018, Poetry, The Grolier Poetry Bookstore-Canbrudge MA. Bookmark the permalink. I’ve never gotten into poetry for some reason. I always think I can’t understand it. I love the quote from Anais Nin you shared! Writing that one down. Interesting bookstore. Thank you for spending time with me at Grolier Poetry Bookstore. I hope you will have time to come back another day for more architecture, location, and the great people who sell books. I’m not a poetry person myself. But I’m still in love with the theme you came up with for A to Z. Once you find the first few poems that speak to you, I found myself on board, but I will admit I was introduced to poetry early on as a child. Hey, there is never enough time to read all the things we love, so come back another day for another bookstore where you can find just the novel you are looking for. 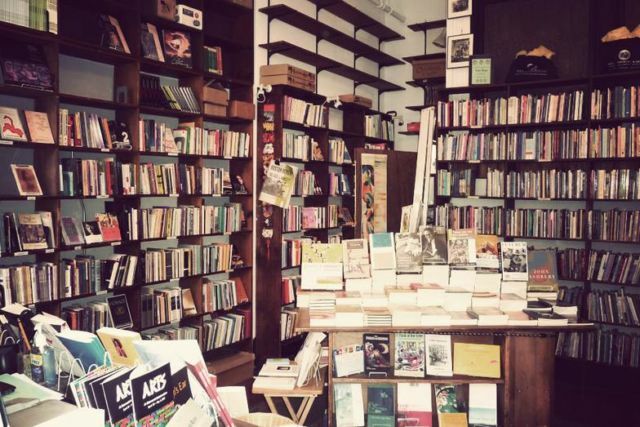 Lovely idea to blog about independent bookstores – they may not be around forever. Makes me think of Kathleen Kelly, Meg Ryan’s character in “you’ve got mail”. I refer to Kathleen Kelly and the movie in my Theme Reveal announcing that I would be writing about Bookstores for this #Challenge. Bookstores, we can’t live without them! Come back when you have time. Wonderful theme as I loved browsing in bookshops, especially old ones with hidden gems published in leather-bound covers. I must admit that my interaction with poetry is eclectic and sporadic – but I have some clear favourites, like Blake. I sat in on poetry readings at several writing conferences a few years ago that I was attending on a regular basis. It was pretty dreadful as if the thought process was….how obscure can I make this? Too obscure for me so I encourage you to continue on with Blake! I notice in your theme reveal you say you would have liked to run a bookshop in another life. Me too! There is one in particular, Sam Read Books in Grasmere in England’s Lake District, that we often visit and I fantasise about. I try to support independent bookshops when possibke, rather than the ubiquitous chains and Amazon, though I confess to still using the latter for ebooks. Oh, I wish you could take me to Sam Read Books, the location is tantalizing enough. I love my e-reader and do a fair share of Amazon book purchases. In sizing down where I live, I am short of shelf space and the 125 books or more on my Kindle take care of that problem. BUT, bookstores have been one of the joys of life and all the books I have hauled home. Let’s pretend we are having tea and discussing “our” bookshop and just how we want it. It’s great to have a bookshop dedicated poetry! Very special niche is say and I’m glad that different owners managed to continue the tradition. I believe I’m like you, my taste in poetry might not fit the general opinion but in a bookshop filled with poetry books I’m sure if find something I like:) Thanks for sharing! Delighted to find you by way of this comment you left. This is why the #Challenge is worth all the effort. Thank you for the warm welcome, Stepheny! Great theme. The independent bookstores in our city shut down years ago. Now we have only a Coles that doesn’t offer the selection the old places with their unique smells did. I hate to hear that you have lost some bookstores. I keep hoping we will solve the dilemma that we love our books, but $27-29 for a novel is too much. I thought book prices would drop but they have not. I love my Kindle as well. We can’t do without a bookstore. Those I have written about are outstanding examples of how to do it. This is such a fascinating theme. Bookstores have a special charm for all bibliophiles. The Grolier seems lovely. Happy to visit myriads of wonderful bookshops through your blog. Pleased that you have found me and like this year’s theme: Bookstores. Charm is the right word for sure. Those that have it are valued. Because of your comment, I will come and find you now. I love this about the #Challenge. How seriously cool. If I was more of a poetry person, I would have to make a trip just to see this place. I was interested in the story that surrounds the owners and objectives of the store. I’m sure one needs to be independently wealthy because I can’t imagine making a living in selling poetry. I’m glad this place carries on. That’s a brave mission. It isn’t easy to sell poetry in today’s world, btu I’m happy this bookstore seems to be winning the battle. Thank you for keeping me company at some of these bookstores during April. The research and writing for the #Challenge were rewarding. Easy to spend the time it takes with something I loved. It’s so great to see these independent bookstores sticking it out. Love that this one has a focus on poetry. I hope they have much success. I recently bought the first volume of poetry I have bought in YEARS. I’m glad they are not depending on me to keep it going. I love poetry but so much of what is written today is too obscure for me. Thank you for keeping me company at some of the stores on the tour. Another great bookstore. I always try to find local bookstore when traveling. If you have a favorite bookstore I wish you would leave the name and locations for others to see here in the comment section. Thanks…..